WASHINGTON (Sept. 12, 2008) -- One survivor of the attack on the Pentagon said she couldn't cry for more than two years after the event -- and today, it still seems unreal. "Why did this happen -- it was so unnecessary for so many people to die," said Mary Lou Bradley, who works for the Army's G-1. "It took me a long time to come to terms with it. For two and a half years I could not cry -- seven years later it feels like it's a bad dream and I'm going to wake up tomorrow in 2001 and everybody will be here." Lt. Gen. Michael D. Rochelle, the deputy chief of staff G-1, spoke with some of the dozens of Soldiers, Army civilians and family members who had gathered to attend a memorial ceremony for G-1 and Manpower and Reserve Affairs employees who died during the Sept. 11, 2001 terrorist attacks on the Pentagon. Bradley was among the many who gathered during a ceremony Sept. 11 to remember the 29 Soldiers and civilians who were lost from the Army's G-1 and Office of the Assitant Secretary of the Army (Manpower and Reserve Affairs) during the terrorist attack seven years ago. 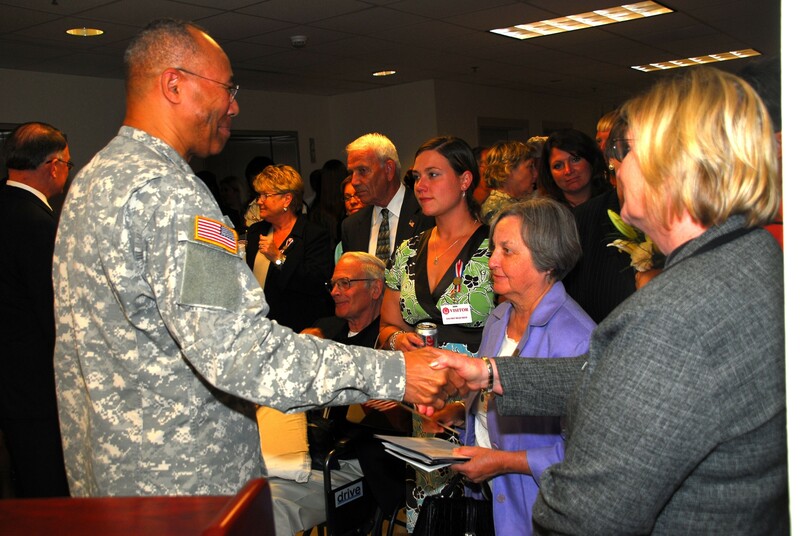 Lt. Gen. Michael D. Rochelle, the deputy chief of staff for G-1, spoke to the dozens of Soldiers, Army civilians and family members gathered near the G-1 offices in the Pentagon. "United in purpose, we continue to grieve for the victims of September 11, and feel for families and friends who lost loved one," he said. "We will long remember the heroes who emerged from the tragedies of those attacks, and will fight the good fight against a global network of terrorism for as long as it takes to end its threat to America and all civilized nations." The G-1 now maintains a memorial to those lost during the terrorist attack. It features the names of those lost, their photos, and the date. During the memorial ceremony, a wreath was placed in front of the memorial. Lois Stevens, a friend and coworker of Bradley, has worked in the Pentagon for more than 30 years now. She said walking past the G-1 and M&RA memorial gives her pause -- time to reflect on those of her coworkers she remembers. "You remember the last thing that a person said to you," she said. "It's a reminder -- I like that memorial very much. One lady, Marian Serva, was our congressional person. When the congressional season gets going, really going -- I'm kind of thinking, oh Marian, help us out. And I miss her. I talked to her that morning. You think about each one every day." Bradley has also visited the new Pentagon Memorial, which is right outside the offices of the Army G-1. She said the memorial is a good place to sit and think, to remember those who were lost. "If you go out there its very peaceful, even when the planes fly over, its not really loud," she said. "And you can sit out there and think. I went out the other day, and went through almost the whole memorial looking for the benches for nine G-1 people. I found them. I sat out there and -- you remember the people when they were alive. You remember the good things about them. I think that's what the purpose of the memorial is. You can reflect."